In a small mixing bowl, cream butter and confectioners' sugar until light and fluffy. Gradually add flour; mix well. Press into an ungreased 11-in. tart pan with removable bottom or 12-in. pizza pan with sides. Bake at 300 degrees F for 25-30 minutes or until lightly browned. Cool on a wire rack. For filling, in a small mixing bowl, beat melted chips and cream. Add cream cheese and beat until smooth. Spread over crust. Refrigerate for 30 minutes. Drain pineapple, reserving 1/2 cup juice; set juice aside. 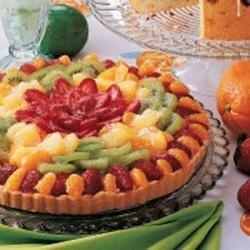 Arrange the pineapple, strawberries, oranges and kiwi over filling. For glaze, in a small saucepan, combine sugar and cornstarch. Stir in lemon juice and reserved pineapple juice until smooth. Bring to a boil over medium heat; cook and stir for 2 minutes or until thickened. Cool; brush over fruit. Refrigerate for 1 hour before serving. Refrigerate leftovers.